Editor’s note: Idan Tendler is the CEO and co-founder of Fortscale, a provider of big data analytics-driven security solutions for Fortune 1000 companies. Before founding Fortscale, Tendler was a lead agent of the 8200, the cyberwarfare division of the Israeli Defense Forces. How does Israel, a small country with roughly 8 million people, produce more tech startups and receive more venture capital per capita than any nation in the world? Why does a country with few natural resources have more companies listed on the NASDAQ than Europe, Japan, Korea, India and China combined? To understand Israel’s innovation success, look no further than the Israeli Defense Forces and the country’s mandatory policy of service for young adults. For me and thousands of Israeli entrepreneurs like me, our startup journey began in the technology units of the Israeli Defense Forces. One unit in particular has become a prolific technology incubator, particularly in the field of cybersecurity: IDF Unit 8200. The 8200 is a special unit, and in many ways, it’s run like a high-tech startup. It begins with finding the best talent. IDF scouts comb the nation’s high schools to identify high-potential candidates at an early age. They target students with superior analytical capabilities, who can make quick decisions and work well in a team environment. Only the best and brightest are routed to this elite cybersecurity group. Instead of relying on outside research and development, the 8200’s technologists work directly with their “customers” (the intelligence officers). All of the unit’s technology systems, from analytics to data mining, intercept, and intelligence management, are designed and built in-house. Technologists sit side by side with their users on a daily basis to ensure that their “products” meet the intelligence officers’ specific requirements. The result is that 8200 alumni have developed critical startup skills and experience even before they start their first company. 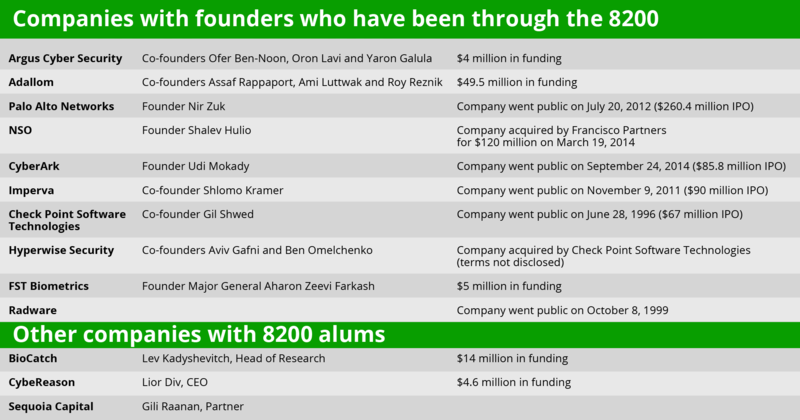 That’s why it’s not a surprise that technology companies, such as CheckPoint, Imperva, Nice, Gilat, Waze, Trusteer, and Wix all have their roots in this IDF unit. One of the earliest and most meaningful sessions during my 8200 training was held on a rainy day back in 1999. Unlike some of my high school friends who were already combat trainees stationed in the cold Negev Desert, Unit 8200 training was held in cozy heated classrooms. We were a bunch of 18-year-old kids who, in a couple of months, would be leading complex intelligence technological operations in Israel’s equivalent of the NSA. In this intense course, we learned how to produce intelligence, leverage the most advanced SIGINT (signal intelligence), utilize sophisticated data-mining techniques, and conceive highly advanced technologies. On that particular rainy day, our instructors ran us through a simulation exercise. They provided us with hundreds of short, fictional pieces of intelligence. Each one, on its own, appeared inconsequential. Very quickly, however, one of my classmates, a future intelligence officer, began to piece together the puzzle presented to us. An intense debate erupted among the trainees about the true meaning of the seemingly unrelated information we had been provided. Our instructors had used the simulation to stimulate a heated discussion and, perhaps more importantly, a leadership test case. While we were passionately arguing whether a war was about to take place in our fictional state, our instructors dramatically stopped the simulation and ended the discussion. They told us that the simulation was based on real-life events, and indeed, a war had broken out. My classmate had been right. It was an important, poignant lesson for my classmates and me. We learned that succeeding in intelligence work required more than just discipline and professionalism. Success required out-of-the-box thinking, the courage to contradict conventional wisdom, and an ability to stave off hubris. A good intelligence officer needed to understand when to bypass hierarchies and be willing to take risks and make mistakes. Today, as a CEO and entrepreneur, it’s fascinating to look back at my time spent in the IDF’s 8200. It was a formative learning experience that helps guide me in my job leading a fast-growing startup. As young adults with no university or professional experience, we ran complex technological projects and initiated startups on a regular basis. We invented best practices in data mining and investigative techniques. We learned to question authority and traditional ways of thinking in order to continuously improve outcomes. Our teams worked almost 24/7 without fear of the challenges we faced. And we did it for hardly any pay. It was in the 8200 where I learned that the passion to invent starts with leadership and values. It begins with the belief that you have a sense of accountability and are doing something important that can change the world. Years later, I brought together a group of 8200 veterans to found Fortscale. We apply philosophies, advanced machine learning, and data-mining concepts learned from our military service to identify malicious user activity and develop security analytics solutions. But our 8200 experience taught us many lessons more valuable than cybersecurity techniques and tools. We learned that success at our startup requires a willingness to constantly take risks in challenging situations, even when we are facing nation-state cyber-adversaries. Success requires a persistent desire to improve and learn from failures.